The $20 gold coins have become a very rare historical opton, a lucrative choice for numismatists and investors at the market, but what are the pros and cons? These are historical gold bullion coins that have a face currency value of twenty dollars, although the value of the gold they contain is far more than the monetary value stated on them. The $20 gold coins were minted in 22 Karat purity and some of the most popular ones are Liberty and Saint Gaudens designs. These coins not follow gold bullion prices very closely but have considerable historical value and rarity attached to them, so the price fluctuates along with the market and demand. Some gold buyers are on the lookout for the rare $20 gold coins in this group, like the 1879-O, but these choices may sell at an auction for fifteen thousand dollars, and it is very unlikely you will find one for a lower price. They are considered legal currency, so they may have tax exemptions and benefits that other coins and forms of gold investment do not. You can find these gold coins for sale through online dealers and auctions, as well as through your local dealers. They will usually hold their value well, and they can be found in varying conditions ranging from poor to mint. $20 gold coins offer many benefits for investors, and they have very few risks or drawbacks. Many investors own a number of them, and many more have started to buy them. 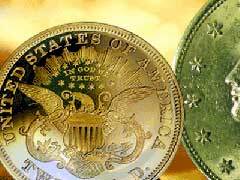 Minted from 1849 until 1933, these older American coins are very popular. New American Eagle gold coins have a face currency value of twenty five dollars versus the value found on the older double eagle $20 gold coins, and they can also make a great investment. One of the few cons with them is that they can drop in value because they are tied to the market price of metal. If the value of gold drops then the metal value of them will also decrease. For rare versions this is usually not true, because the numismatic value exceeds the gold bullion value. One major con that come with investing in these type of historical coins is definitely their price. Since any precious metals investor’s goal is to pay the lowest investment fees, some of us will do better with other lower cost bullion coins and reserve these historical coins for numismatic market.